Beyond all the eye-popping special effects and all the top secret special revelations, the latest incarnation of "Star Trek" from director J.J. Abrams left this moviegoer with several vivid impressions still buzzing through his brain long after having left the theater. About halfway through the film, as Lieutenant Commander Montgomery Scott's fusion-powered shuttlecraft closed in on the orbit of Jupiter, that relatively short interplanetary milk run brought to mind several recently published articles on the subject of advanced deep-space propulsion. The promise of Mars in 30 days, or Mars in just a few weeks, was the common theme running through most of the articles. Exotic new engine technologies designed to produce constant acceleration would also generate a degree of artificial gravity while propelling those spacecraft toward their Red Planet rendezvous. Mars in 30 days. Not quite as speedy as Scotty's little jaunt out to the fifth planet, but a significant improvement in the transit times typically considered when speculating on future scenarios for such voyages. My personal dreams of Mars began at a very young age, during the days of Gemini and Apollo. Back then there was talk of The NERVA Nuclear Rocket Program that would develop nuclear propulsion to take astronauts to the Red Planet and beyond. Another victim of more "urgent" Earth-based priorities, Project NERVA was canceled in 1972. Apollo ended in 1975, and along with it so did many young dreams as a nation fitfully retreated from hard-won lunar beachheads and slowly lost focus on The Final Frontier. It would be another six years before another American even came anywhere close to outer space. In all those dreams of one day traveling to the Red Planet, I will honestly admit that I was never in such a hurry to finally get there that I wanted the trip to take forever. Thirty days, on the other hand, is a period of time that I believe the average spacefarer of tomorrow could easily endure. And when the competing commercial giants of the near future finally develop the advanced technology necessary to make that time frame possible, humankind will have crossed a threshold in its long history as significant as any other that has ever been laid before its path. What other world-changing breakthroughs in space technology lie ahead of us on the horizon of The Final Frontier? Beyond this solar system lies the rest of the galaxy, utterly unreachable at present by any means other than exploration by telescope. Yet, there are those who have already dedicated themselves to one day bridging the vast expanse that lies between each star. The 100 Year Starship Foundation was formed in 2012 with the less than modest goal of achieving the reality of interstellar travel in the next 100 years. The Defense Advanced Research Projects Agency and NASA provided the organization with its initial funding, which is at present working to advance and build upon the theories of a growing number of scientists who believe that faster-than-light travel can one day be achieved. Travel through space poses significant medical risk to the human body. Prolonged periods of weightlessness always lead to a certain degree of loss with respect to bone mass, as well as unavoidable exposure to cosmic radiation. Nuclear engines operating under constant acceleration may generate enough simulated gravity to help alleviate the loss of bone mass to a certain extent. The centripetal force generated by revolving large circular habitation rings about the longitudinal axis of a spacecraft is another possible solution. Thick inflatable walls filled with water or other liquids can effectively shield against deadly cosmic radiation. In the "Star Trek" universe, the Enterprise addresses this problem through the employment of impenetrable energy shields that surround the ship within a veritable cocoon. Such a solution may one day be available to 21st century space travelers as well. Researchers at the Rutherford Appleton Laboratory in Oxfordshire, England, are developing a "miniature magnetosphere" to see if a "deflector shield can be used to protect humans living on spacecraft and in bases on the Moon or Mars." The USS Enterprise (NCC-1701-A) was a Federation Constitution-class heavy cruiser, the second to bear the name "Enterprise." Vessels as large as the Enterprise will one day be assembled in orbit or beyond Earth orbit through advances in robotics and 3D printing. Using the raw materials of asteroids, automated machinery requiring limited interaction from human beings will assemble immense structures such as solar power satellites, space stations and interstellar starships far from the surface of the Earth. Large 3D printers will build our future moon bases and allow for the construction of massive structures on the surface of other planets and deep in outer space. We're all familiar with the many classic examples of "Star Trek" technology that eventually evolved into real-life products and transformative industries. The primitive surface-to-starship communicator turns into the sophisticated present-day smartphone. The Starfleet Issue computer in Captain Kirk's quarters first turns into a desktop and then a laptop and now an iPad. In the fourth installment of the "Star Trek" film franchise, the Enterprise officers are thrown back in time to the bygone days of 1986. In order to find their way back to their own time line, Commander Scott elects to reveal the formula for transparent aluminum to the scientists of that era in exchange for materials vital to the completion of his mission. Thus in an apparent paradox of time travel, a new wonder alloy is prematurely introduced to the denizens of the 20th century. But, what many viewers at the time did not realize, was a similar high-tech material — ALON® Optical Ceramic — was already in existence and in 2009, a team of scientists led by researchers at Oxford University created actual transparent aluminum. ALON® serves many uses today, from optical ceramic windows to lightweight tactical armor. The five-year mission of the Enterprise was to "explore strange new worlds, to seek out new life and new civilizations, to boldly go where no man has gone before." The "M-Class" planet was the primary target of investigation: an Earth-like world where similar forms of life were expected to evolve. Today, planetary scientists comb through mounds of data collected by Kepler and other planet-hunting satellites and telescopes in search of this "holy grail" of exoscience. So far, Kepler alone has unearthed over 3,000 exoplanet candidates and some 132 confirmed exoplanets, but the so-called "Earth-like" planet itself still remains elusive. Finally locating one will not be just a matter of wish fulfillment. With the development of interstellar travel, Earth-like planets will be some of the first places we visit in the search for alien life — and for the purposes of potential human settlement. So far the jury is still out, but most exoscientists believe that finding such a planet is only a matter of time. 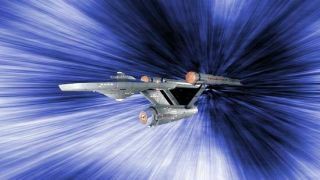 And time will eventually reveal how many of the revolutionary new technologies from "Star Trek" actually come to pass. A hundred years ago, how many people could honestly imagine that in less than 60 years human beings would one day stand upon the moon? The technological advancements of the next 100 years will be no less astounding. More than a hundred years ago, around 1903 to be exact, not too many people would have given the Wright Brothers much of a chance. But, in retrospect, that all turned out pretty well. The views expressed are those of the author and do not necessarily reflect the views of the publisher. Original article on SPACE.com .